Bettas can survive in bowls, but do their best in small aquariums. King bettas are a breed of betta splendens, also known as the Siamese fighting fish. As small aquarium fish, they typical have a shorter lifespan than other pets. However, you can extend your betta's lifespan with a few simple tricks. How Old Do Bettas Get? The lifespan of your king betta, like any other betta, ranges depending on a number of factors. Care, feeding and the fish's genetics can all affect how long a betta will live. With this in mind, a betta's lifespan can range from two to five years, depending on how well you care for your pet. Most bettas live an average of two to three years. The only way to tell a betta's age is by its size although, at best, size gives you only a rough idea. A younger fish is usually smaller than an older fish. 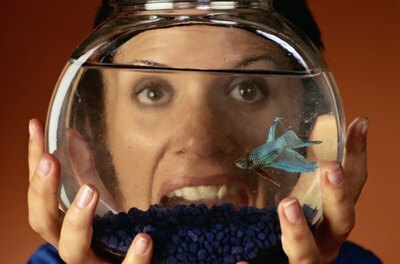 This typically works until the betta reaches adult size (3 inches for a male, 1 1/2 inches for a female) at a year old. 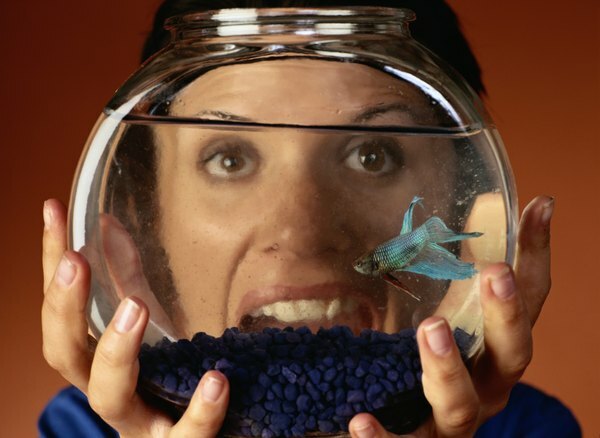 King bettas will be larger than regular bettas, so keep this in mind. You want to get a younger fish if possible since they have such a short lifespan. You can extend the life of your king betta a few ways. Good housekeeping, like keeping the tank clean, will improve the health of your king betta. Also, keeping them in a larger bowl (or even a full aquarium) typically keeps them healthy and longer-lived. Food is also important. Feed them live, frozen and freeze-dried foods like bloodworms and brine shrimp. Not only will your king bettas love you for it, it improves their lifespan and health. It's hard to tell aging from other diseases that affect bettas. Sometimes, you can only tell your fish is old by ruling everything else out. The signs include clamped fins, large size and a dulling of its colors. Your fish also might react more slowly to stimuli. If you keep your king betta with other fish in an aquarium, it may have trouble keeping up during feeding time.